Does your family enjoy making homemade treats? 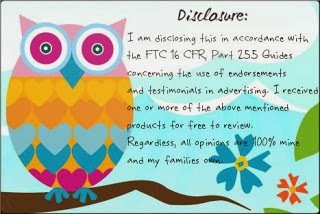 I know that ours does and with that said I would like to introduce you to a wonderful company that helps us do just that make yummy treats at home. Well if so then I would like to tell you about the next exciting item we have in our Holiday Gift Guide! 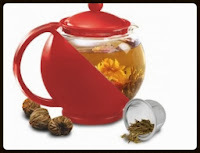 Primula Half Moon Teapot is the easy and fun way to make healthy and yummy flowering tea at home with your family! I am not a fan of tea but my in laws drink tea everyday and I can not wait to give this wonderful Teapot to them for Christmas! This beautiful Half Moon Teapot is made of hand blown borosilicate glass, accented with a modern half-moon black design. It provides the ideal window to view the flowering teas in a stylish, contemporary teapot. 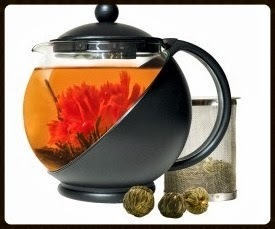 The teapot is a 40 oz crystal clear design with black lid, handle and half moon base displays blooming teas within the teapot. The large secure handle and rounded spout makes this teapot perfectly crafted for pouring up to 5 cups of hot tea. You can enjoy watching flowers unfurl or insert the included stainless mesh loose tea infuser for loose tea brewing. The Half Moon Teapot is extremely durable and dishwasher safe! One thing I love is stuff that is dishwasher safe! This beautiful gift set includes 3 flowering green teas. So you can enjoy antioxidant-filled AA grade green tea with fresh jasmine. Primula's green tea is specially chosen from the Fujian Province on China's southern coast. This area is known for producing some of China's finest teas. Each gift set includes easy brewing directions so you can enjoy a delicious pot of flowering tea right out of the box. This beautiful set can be bought in Black or Red. You can purchase a Half Moon Teapot on Primula's Website!